"We wanted Stan to be outside, to be in Catopia. It was raining out and so we were sitting beneath our covered deck. I actually administered the euthanasia injection myself." 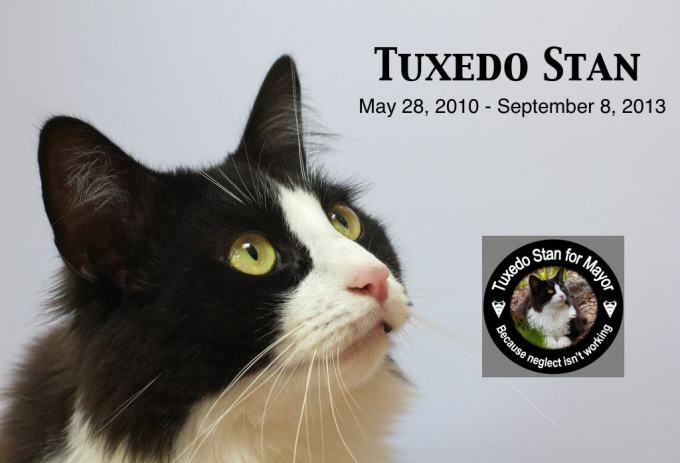 Although the death watch had begun way back in January when it was first publicly disclosed that Tuxedo Stan was suffering from renal lymphoma, the announcement on September 8th that he had been killed off earlier in the day at 4:55 p.m. by his owner nevertheless came as a shock. Regardless of whether death comes instantaneously or is a long-drawn-out affair, there simply is not any way of mitigating the pain and sadness that accompanies the demise of any cat. That holds true for both nameless homeless cats as well as for those who have achieved worldwide renown. Thanks to his campaign to become the next mayor of Halifax in Nova Scotia, Stan leapfrogged seemingly overnight into the latter group and as a consequence the sorrow occasioned by his untimely death has been felt weit und breit. Although his name was not technically on the ballot in last year's October 20th primary, his campaign was for real in every other sense. For instance, the Tuxedo Party was formed in order to promote his candidacy and he quickly secured the endorsements of both CNN's Anderson Cooper and entertainer Ellen DeGeneris. Regrettably for him and the world, Stan did not prevail in that election. Then, three months later, came the heartbreaking disclosure that a cancerous tumor had been detected on his left kidney. "He has pretty serious troubles but we are doing what we can for him," his owner, Hugh Chisholm, confided to the News Herald of Halifax on January 24th. (See "Mayoral Hopeful Tuxedo Stan Battling Cancer.") "Unfortunately, it is not something that can be surgically removed because lymphoma is often located in other places, even though it may not show up on testing yet." Most distressing of all, there is not any known cure for feline renal lymphoma although chemotherapy, a corticosteroid known as predinisone, and nutritional supplements usually are prescribed in order to slow down the advance of the disease. Both the Feline Leukemia Virus (FeLV) and the Feline Immunosuppression Virus (FIV) have been identified as the most likely causes of the deadly malady. Normally, the disease afflicts cats that eight or more years old but the fact that it stuck down Stan during the third year of his life just goes to show that even the tenderness of youth is not any protection against it. In spite of all of that Chisholm initially attempted to put a brave face on a truly tragic situation. "The good news is that his right kidney looks pretty normal and his kidney function is still good," he added to the News Herald. "Those are the things in his favor but it is a high grade of lymphoma, meaning...it is a fairly aggressive tumor." Six months of both oral and intravenous chemotherapy were begun on January 23rd but by June the tumor had begun to grow again and Stan's kidneys began to fail. From that point on his fate was pretty much sealed. "He died peacefully. He was sitting in my wife's lap," Chisholm told the National Post of Toronto on September 9th. 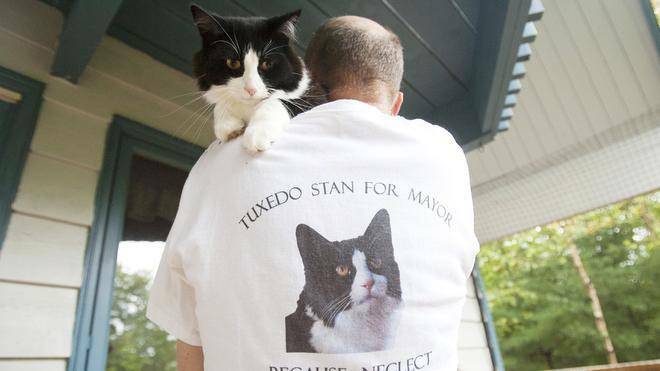 (See "Tuxedo Stan -- the World Famous Halifax Cat Who Ran for Mayor -- Has Died of Kidney Cancer.") "She had his favorite mat, a rainbow rug he used to like to lay on by our door, and so he lay on the mat on her lap." Being a retired veterinarian who in all probability has dispatched thousands of cats, dogs, and other animals to the devil during his long career, Chisholm did not shy away from doing likewise to his own cat. "We wanted Stan to be outside, to be in Catopia. It was raining out and so we were sitting beneath our covered deck," he told to the National Post. "I actually administered the euthanasia myself." In keeping with the long-standing policy adhered to by just about all veterinarians, individuals, shelters, and rescue groups, Chisholm conveniently neglects to inform the public exactly why he was so dead set against allowing Stan to die a natural death. As a practitioner of veterinary medicine, he undoubtedly is aware that even terminally ill cats can be made comfortable and thus allowed to die on their own terms. No human intervention is either needed or warranted. To his credit, there can be little doubt that Chisholm cared deeply about Stan. "It was extremely hard to say goodbye to Stan," he told the National Post. "He was a very special cat." He even went so far as to provide him with a large, fenced-in yard that he dubbed Catopia. That spared him not only the cruel injustice of being incarcerated indoors all the time but at the same time protected him from the debilitating effects that indoor pollutants can have on a cat's health. Best of all, Catopia allowed him to experience an outdoor environment that was free of the machinations of motorists and other ailurophobes. Money does not appear to have been a consideration either in that Chisholm is financially well-off. He even turned down donations from the public and elected to pay for Stan's chemotherapy out of his own pocket. Another possibility is that he simply grew weary of caring for a dying cat. Regardless of his true motivation, he has demonstrated by his actions that he earnestly believes that man has a right to kill cats and other animals with impunity. In that regard, Chisholm is by no mean alone. For example, his fellow practitioner, John Bradshaw of the University of Bristol, has been busy of late making the rounds on the rubber chicken circuit in order to promote his new tome, Cat Sense. In doing so, he has not hesitated to preach the gospel of the misnomered and grossly misused practice of euthanasia. From there he went on to declare that cats not only do not have any concept of death but do not appreciate efforts undertaken on their behalf in order to prolong their lives. "If I was a cat and lived in the here and now and didn't have any idea that death was final -- because I don't think they do -- then what would I want for myself and then answer that little voice in your head and obey it," he pontificated to Fresh Air. "Is the animal having quality of life?" is the only valid consideration as far as he is concerned. If not, kill it, he counsels. Regardless of whatever else may be said for Bradshaw and his warped morality he is unquestionably a remorseless practitioner of what he preaches. "No, I have not regretted having any of my animals euthanized," he proudly confessed to Fresh Air. First of all, Bradshaw does not produce one scintilla of evidence in order to substantiate his outrageous dogma. Secondly, although speculating upon what cats are thinking is always a dicey proposition, a preponderance of the available anecdotal evidence tends to suggest that he is off his rocker. A compelling case therefore could be made that the animals and nature are far more alive, knowledgeable, and compassionate than man. Their only problem is that they are totally defenseless against a beast as thoroughly unprincipled, supremely evil, and destructive as man. Falsely accusing cats of being ignorant about matters of life and death does, however, serve to provide individuals like Bradshaw with yet still another excuse for continuing to exploit and kill them at will. That same perverted logic and morality also is employed in order to sanction vivisection, the eating of meat, and a host of other heinous crimes that are committed on a daily basis against the animals and Mother Earth. Trumping all of those concerns is the moral issue and in that regard the killing of any cat, regardless of its state of health, never can be justified. Therefore, no matter how idyllic the setting or how beautiful the apology, what Chisholm did to Tuxedo Stan can only be regarded as premeditated, cold-blooded murder! He never could get away with doing likewise to a fellow human being and that moral prohibition should be made equally applicable to Tuxedo Stan and all other cats. In coming out in favor of the legalization of assisted suicide in England, even noted cosmologist Stephen Hawking did so with reservations. Therein lies the rub, as Hamlet would say, in that cats do not have any way of making their intentions known to man. Accordingly, the only moral and compassionate avenue left open to man is to hold sacrosanct their inalienable right to live and to do everything humanly possible in order to preserve their lives. Since he quite obviously has little or no respect for the sanctity of feline life, it is not surprising that Bradshaw is so willing to make what little time that they are allotted on this earth as miserable as possible. He goes about doing that by first of all dishonestly segregating the species into ferals and domestics. Anyone even remotely familiar with the subject knows only too well that to make such an absurd distinction is tantamount to branding orphans as feral boys and girls. As an old American proverb stipulates, "A cat is a cat and that's that." From there he went on to tell Fresh Air that feral kittens, and presumably feral cats as well, cannot be socialized. That is simply an outright lie! Any cat can be socialized to one degree or another so long as individuals and groups are willing to invest the prerequisite time and effort in the project. Sadly, not many rescue groups and shelters are willing to make that effort. 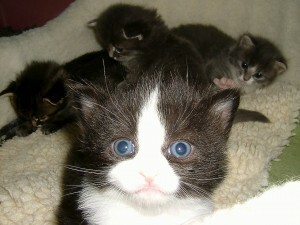 It is much easier to simply label homeless cats are ferals as a prelude to snuffing out their lives. It also is considerably more economical than the morally acceptable alternative of socializing and providing them with homes. 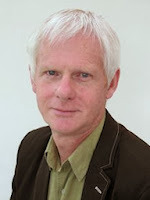 Bradshaw and his colleagues at the University of Bristol also have appropriated for themselves the right to shanghai cats into becoming guinea pigs. For example, in April of this year he and his fellow exploiters hoodwinked residents of Shamley Green in Surrey into loaning them the use of fifty of their cats. The Smithsonian later published Dauphiné's tainted and trumped up research of alleged feline predation of birds and the capitalist media ate it up as if it were manna from heaven. Deplorably, neither the courts nor any rescue group has been willing to hold the dishonest and slimy Smithsonian accountable as to where it gets its cats and, more importantly, what becomes of them once it has finished with them. 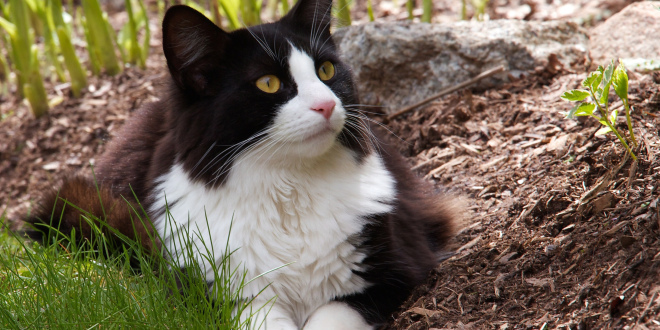 The myriad of problems associated with the widespread use of so-called euthanasia extend far beyond the killing off of terminally ill cats like Tuxedo Stan. In fact, the practice has become so commonplace and accepted that it is now almost synonymous with feline population control. To begin with, most individuals see absolutely nothing morally reprehensible about having their cats killed off once they become either elderly, sickly, or simply unwanted. In most cases it is strongly suspected that they merely are too cheap and lazy in order to care for them in their hour of greatest need. The situation is compounded by veterinarians who charge a king's ransom in order to treat sick and injured cats. Worst still, whenever a pet owner is either unwilling or unable to pony up they, scared to death of losing a paying customer, offer to kill off the cat at a cut-rate. Such a practice is patently unethical and constitutes a blatant conflict of interest in that veterinarians should be using their skills only to save lives. Moreover, unless this practice is permanently outlawed the killing is never going to end. 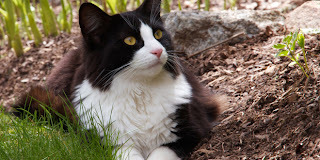 Not a great deal is known about Stan's early days other than that he was born at a veterinary hospital, most likely Chisholm's own Atlantic Cat Hospital, three weeks after his pregnant mother was rescued from the streets of Halifax. It therefore is conceivable that his mother may have infected him with either FeLV or FIV and that in turn could have been what triggered the onset of renal lymphoma. Despite having been born into poverty he was able to seize Glück from Umglück when Chisholm elected to give him a permanent home. "I knew Stan from the day he was born," Chisholm averred to the National Post in the article cited supra. "He was a real bright light, and when I saw that and saw his stunning good looks I said, "Enough, I am bringing him home with me'." In addition to Chisholm and his literary wife, Kathy, Stan is survived by his brother, Earl Grey, three other cats, two dogs, a pair of guinea pigs, and seventeen-thousand, five-hundred followers on Facebook. It has not been possible to determine if his mother and two other brothers are still alive. No funeral or burial plans have been announced but hopefully he is resting comfortably in Catopia beneath a fitting tombstone. Most likely that is what he would have wanted under the circumstances. In May of this year, the Halifax City Council gave $40,000 to the Nova Scotia SPCA in the Dartmouth section of the city in order to establish a low-cost sterilization clinic in Stan's name and that likely is destined to be his most lasting legacy. There is even some speculation that Earl Grey may take over for him and continue his advocacy. The sterilization mills run by rescue groups are not much of an improvement in that there are far too few of them, they impose too many restrictions, charge too much, and also botch too many surgeries. Most frightening of all, the poor who utilize their services do not have the means of procuring alternative emergency veterinary care whenever they mutilate their cats. For example, although PetSmart Charities donates huge sums of money to rescue groups that sterilize cats and dogs, those groups turn around and not only charge for their services but impose residency restrictions as well. In New York City, The Toby Project sterilizes for free the cats of city residents that receive public assistance but charges all others $60 in order to spay a female. Although these and similar efforts are a step in the right direction, they are far from being any panacea. First of all, many individuals who cannot afford to have their cats sterilized are unable, for one reason or another, to get public assistance. Secondly, some individuals are too niggardly to pay for having their cats sterilized even though they have money to burn. Therefore, in order to make any genuine progress in this area it is incumbent that sterilization services be offered totally free and without restrictions. In particular, all individuals and groups involved in this effort need to immediately stop attempting to punish and denigrate individuals and instead concentrate all of their efforts on the welfare of cats. If they somehow could be prevailed upon to do that, as well as to outlaw euthanasia, then and only then will Tuxedo Stan not have lived and died in vain. Photos: Facebook (Stan in memoriam), Hugh Chisholm (Stan outdoors), University of Bristol (Bradshaw), Tuxedo Stan.com (Stan as a kitten), and Ryan Taplin of the News Herald (Stan and Chisholm).